On Super Bowl Sunday I punt. I eat and drink whatever I want, and my only exercise is mashing the avocados and going to the fridge for more beer. That’s The Football Diet. The next day I go on offense and lose one pound in one week. That’s The Football Diet too. After two weeks of offense, I’ll go on defense for a week. I won’t push to lose weight, but The Football Diet’s blocking and tackling techniques will keep me from gaining those pounds back. Most diets try to keep you on offense, always throwing the ball deep. The Football Diet gives you a more realistic game plan, focused on moving the chains just ten yards at a time. Most diets only train you to lose weight. But The Football Diet helps you feel great physically and mentally over the long haul. It trains you in a balanced approach with both offense and defense, and it coaches you to accept fumbles as just part of the game. It’s time for a new game plan. Here’s your quickstart guide to the Football Diet. Offense & Defense. Every week you’re either on offense or on defense. During an offense week, you’re trying to lose one pound. During a defense week, you’re trying to not gain weight. Offense weeks help you lose weight. Defense weeks give you a break without losing ground, and they set you up to maintain a healthy weight over the long haul. Special Teams. Every now and then, you need to punt. On days like Super Bowl Sunday and Thanksgiving Day, I punt. I spend the whole day sitting down, eating and drinking whatever I want. 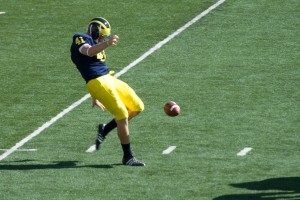 Unlike offense and defense, which each last a week, a punt only lasts one day. Then it’s back to offense and defense. Blocking & Tackling. Playing offense and defense is mostly about the mentality and motivation you bring to the game. And blocking and tackling is all about the fundamental skills you apply while playing offense and defense. This is where we talk about setting ourselves up for success by doing the basics right.